Deer fencing is always your best defense against hungry deer, we understand that not everyone can or wants to go this route. HOA’s and town regulations often prevent deer fencing from being installed. In addition, some homeowners biggest pest problem is deer feasting on landscape plantings in the front yard which let’s face it is the last place most of us want fencing. Luckily, there are ways to minimize the risk of deer browsing in your gardens. There are known plants that deer just cannot seem to resist such as; hosta, blueberry, buttercup, pansies, hybrid roses and more. On the other hand, there are some plants that deer will pass by without a glance. 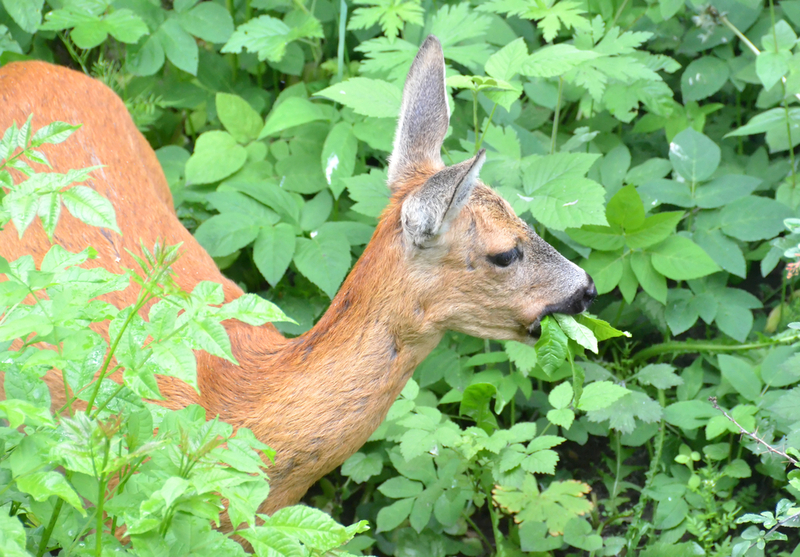 Similar to humans, whether a deer likes a certain plant or not comes down to taste, texture and odor. Sometimes you really love a plant that deer seem to love too, it happens. Just because a plant is not on the deer resistant list does not mean you have to avoid it, planting it in the proper place can go a long way to saving your prized lilies. Whenever possible, plant vulnerable annuals, perennial and shrubs close to the home such as in border beds, near the front door or in containers on the deck. Another method of protection is to surround the desired plant with other plants that are on the deer resistant list. If neither of these options will work for your garden try using systemic tablets as an effective deer repellent, these are great since you only have to apply twice a year and they are all natural. Deer are habit-forming animals, following the same path every afternoon, visiting the same gardens and bedding down in the same spot every night. If you notice one particular bed in your gardens receive all the deer attention then it is safe to say this spot will never be problem free. Plant only from the deer resistant list and reinforce the bed with a repellent or covering during the winter months as an extra safeguard. It is important to remember that this is just a deer resistant list not a deer proof planting list. If deer are hungry enough they will eat just about anything, and we do mean anything, even going so far as to ditching their vegetarian lifestyle and eating meat. Here is a sample list of deer resistant annuals and perennials plants. For a complete list including shrubs and trees specific to your area, contact your local extension office.